As a child, one of my favorite Christmas programs was the animated classic, Rudolf the Red Nosed Reindeer. One particularly memorable scene involves a visit to the Island of Misfit Toys, where due to various problems (a train with square wheels and a cowboy that rides an ostrich), the toys don't have homes. Rudolf convinces Santa to find children that will love the Misfit Toys resulting in a happy ending. I couldn't help but see the similarities between the Island of Misfit Toys and Machineko. Located near the Akihabara station on both the metro and JR line, I paid Y1000 ($8.91) for one hour and stepped inside. 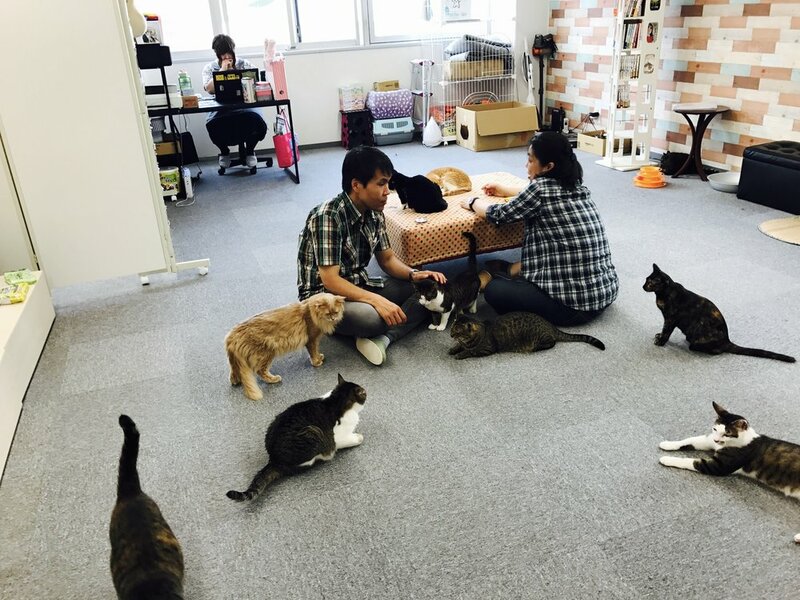 The room has a bit of an industrial office environment-- florescent overhead lights, wide open, uncluttered with no tables and chairs, the set-up is not cozy and cafe-like, but is successful in encouraging interaction with the cats. All of the approximately 18-20 felines in residence at Machineko are rescues and awaiting permanent homes-- most are quite playful and social. You could tell that some of the cats had problems, both physical issues like scars and bent tails as well as psychological, like one shy boy that wouldn't come out of the yellow house, but considering they all came from the streets, were reasonably well-adjusted. There was a vending/coffee machine, but I was coffee-ed out by the time I made my visit, so did not get a chance to assess the quality, but that was fine because I was here for kitty love. The friendly owner really wants you to enjoy the cats and provided a few treats to the patrons which put all balls of floof on high alert. I had a grand time during my hour here and it made me feel good to know that while they are working to find permanent homes for these sweet babies, they have found a safe haven surrounded by love. If playing with kitties is your goal and, like me, love a happy ending, make your way on down to Machineko and support the great work these folks are doing.